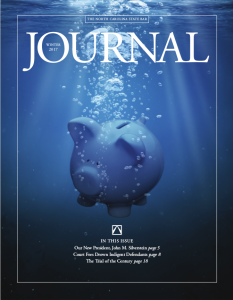 Steve Owen, AIRE co-founder, and Audrey Koncsol, a 3rd year law student at Wake Forest University, wrote this article for the North Carolina Bar Journal (PDF) in December of 2017. The referenced lawsuit is moving forward in federal court and the latest developments in the suit can be found at OurChildrensTrust.org. This article is particularly relevant given the amount of climate-related news (wildfires, hurricanes, heat waves, etc. although rarely reported as such) and the storms swirling around the U.S. Supreme Court. 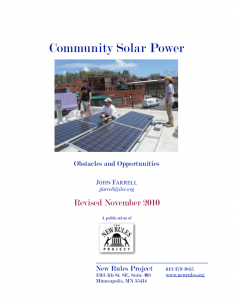 John Farrell, whom we consider to be one of the leading thinkers on community solar, wrote this 2010 report, which we think is worth reposting for benchmarking and reflection. Participation and ownership were the key things we wanted to experiment with in our project described in the report. This was at a time (wow, 8 years ago!) when precious little was really understood about how to actually do tax equity finance for community projects, while at the same time there was plenty of hype about tax credits and the good times to come. David Brosious at University Park Solar (another of the author’s case studies) was a smart thought partner and generous fellow traveler.